As part of every service or repair we will carry out a complimentary Robins & Day Vehicle Health Check – This includes a comprehensive visual check including lights, tyres, exhaust and suspension. What is a Robins & Day Vehicle Health Check? A Robins & Day Vehicle Health Check is completely complementary, and assesses the current condition of your car, and allows you to make decisions of any work needed on your vehicle. The vehicle health check is carried out by one of our manufacturer-trained technicians, with the results presented in a report. 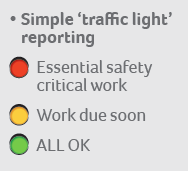 There is a simple traffic light system to show you any work that is required immediately or in the future. You will also be sent a video to your mobile phone, which clearly shows you the results of the check and any work required. With a Robins & Day Vehicle Health Check, you can assess and authorise work online.